Maybe. I didn’t mention it during my cranky, sick E3 review last week but I did accomplish a few things with the game, and I this week I did more. Aside from various bug fixes, here’s this week’s run down on Super Slam Dunk Touchdown Season Mode development for Xbox One. Now you are taken to the tryouts player selection screen automatically if there is a new player to tryout. I’ve added descriptive text about the new player there, as well as an arrow pointing them out. Additionally, I’ve improved the feedback Coach Clip gives you during the tryouts. Players now use the custom team colors you have selected in all cut scenes and endings. I cleaned up the solo ending; the co-op ending seems lame by comparison. More work to do there. The crowd will react to your standings in the season, getting especially excited during the finals. Coach Clip will give a tip if you are getting pummeled and not blocking attacks. Also, the win/loss records were showing the value prior to the most recent game, so that was fixed too. 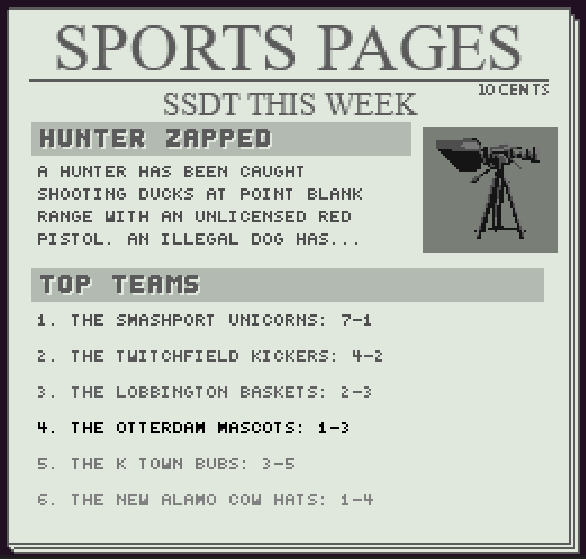 There have been a few tweaks to the Sports Pages. The text contrast was improved, I’ve added more content that reacts to your current season, and the ranking players go from darker to lighter on the TOP TEAMS list. The player team will blink darker slowly. I’ve also added a SHOP button that opens a non-functional fake shop. The button only appears if you have money. That’s pretty much it, except for some other stuff probably. Have a weekend!